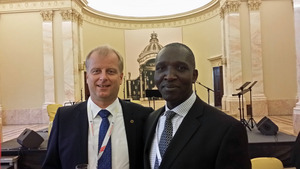 At the invitation of the Executive Secretary of the Inter-European Organization of Tax Administrations, the Executive Director of CATA joined other delegates for the IOTA 20th General Assembly that was held in Bucharest, Romania. The theme of the Conference “big data” proved to be a very timely and interesting topic in the light of recent developments in the area of transparency and Exchange of Information. The new international transparency and reporting standards coming out of the BEPS work is expected to see massive and real time flow of data between jurisdictions that if not well handled may pose innumerable challenges to tax administrations. Of particular concern is the Automatic exchange of Country-by-Country reports which is expected to commence in 2017 and of which adequate preparations to manage that data is a key concern. Luckily, there are numerous software developers who can assist in this process. On the side-lines of the Conference, the Executive Director held a meeting with his IOTA counterpart Mr Jan Christian Sandberg and the CIAT Director of Planning Mr Socorro Velazquez.